How much is Adam Levine Worth? Adam Levine net worth and salary: Adam Levine is a singer, songwriter and television host who has a net worth of $120 million. Adam Levine is most famous for being the lead singer of the band Maroon 5 and as one of the celebrity hosts of NBC's reality TV series The Voice. Adam earns $8 million per season for hosting The Voice alongside hosts who have included Blake Shelton, Usher, Shakira and Christina Aguilera. He was born in Los Angeles, California on March 18th 1979. He was a writers assistant on the television show Judging Amy before he hit it big in the music industry. 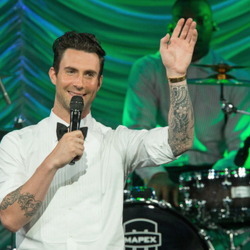 Adam met his future Maroon 5 bandmates while they were all attending the exclusive Brentwood School in Los Angeles. During his time on Judging Amy, Adam wrote several poems and songs about an ex-girlfriend named Jane. These notes would eventually turn into Maroon 5's first smash hit album "Songs About Jane" which was certified triple platinum after its release. Adam has since gone on to date several Victoria's Secret models and the band has released several more extremely successful albums. Adam married supermodel Behati Prinsloo in 2014. They have two children together. In addition to his work with Maroon 5, Adam Levine has appeared as a guest singer on dozens of singles alongside many popular artists. Since releasing their debut album, Maroon 5 has sold over 30 million albums worldwide, including 10 million in the United States alone. The group has also sold over 30 million digital singles. Maroon 5's albums It Wont' Be Soon Before Long in 2007 and V in 2014 both reached #1 on the Billboard 200 chart. The band's popular singles include "Harder to Breathe", "This Love", "She Will Be Loved", "Sunday Morning", "Makes Me Wonder", "Moves Like Jagger" (featuring Christina Aguilera), "Payphone" (featuring Wiz Khalifa), "One More Night", "Maps", "Animals", "Sugar", "Don't Wanna Know" (featuring Kendrick Lamar), and more. Levine has won multiple Grammy Awards, Billboard Music Awards, and American Music Awards. September 2010: First Added to CelebrityNetWorth with an overall wealth estimate of $5 million. 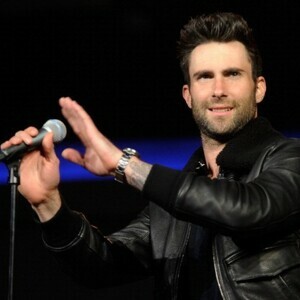 Adam Levine Salary from The Voice and Other Ventures: During his first season appearing on The Voice, Adam's salary was $6 million. By 2015 he was earning $10 million. That bumped to $12 million in 2016. In 2015 and 2016 his total income from all sources topped $35 million each year. From 2017 onward, Adam's salary on The Voice has been $13 million. In 2018 his total income from all sources topped $68 million. Adam Levine Net Worth from Real Estate: In March 2018, Adam paid $34 million for a 12,000 square foot house in Beverly Hills. They bought it from Will & Grace creator Max Mutchnick. Mutchnick bought it from Pete Sampras and his wife Bridgette Wilson in 2008 for $14.5 million. Adam and Behati spent $7 million remodeling the house over a year and then listed it for sale in April 2019 for $47.5 million. If they get their asking price, they'll make a $5 million profit in a year. Adam sold two other mansions in Beverly Hills in 2018, including one to John Mayer for $13.5 million. In 2017 he bought a house in Holmby Hills for $17 million, gutted it and prepared renovations. For some reason he lost interest and ended up selling it mid-construction for $18 million. He still owns another large property in Beverly Hills that he bought in 2012 for $5 million. Earlier in 2019 Adam and Behati spent $32 million to acquire Ben Affleck and Jennifer Garner's former house in the Pacific Palisades. Ben and Jen paid $17.55 million for the house in 2009. That means for much of 2019, Adam owned at least $80 million worth of Los Angeles real estate alone.